The Law Offices of Ronald E. Sholes serve Florida and Georgia's injured with aggressive representation and the personal service that they expect and deserve from a law firm. Our 12 attorneys, four investigators and over 40 professional and support staff are here for you. Whether you or a loved one have suffered whiplash, serious injury or a wrongful death or have been injured as a result of an auto accident, semi truck accident, motorcycle, pedestrian or other serious accident, slip-and-fall or other premise liability, medical malpractice, product liability or an other form of negligence, you can rest assured that we understand the claims process and we will guide you through the process each stop of the way. Our team includes former insurance adjusters, a former insurance defense attorney, a retired FHP trooper, and a dozen attorneys with over 100 years of combined legal experience. As a law firm of military veteran attorneys, we bring the same sense of service, commitment and dedication to your case that has seen our attorneys through tours of duty in the Army, Navy and Marine Corps. When you hire us, you're hiring a law firm that understands your health and your claim are important to you. We take both very seriously and we will make sure your rights are protected and that you are kept fully informed along the way. Our approach to accident and injury litigation emphasizes early investigation, so don't delay! And, unlike many law firms, we don't just settle! We don't simply take what the insurance company wants to pay, but rather we demand and fight for fair and just compensation for your injuries and all of your damages, including your economic and non-economic damages. Our motto is simple: You Hurt? We FIGHT!" We don't just settle. We demand and fight for the compensation our clients deserve, including economic and non-economic damages as a result of their pain and suffering, loss of enjoyment of life. We are Florida and Georgia auto accident and personal injury lawyers aggressively representing accident victims. With a half dozen fully-staffed offices and a team of more than a dozen military veteran attorneys, we're here to serve you. As military veterans, we bring the same sense of service, commitment and dedication to your case that has seen our attorneys through tours of duty in the Army, Navy and Marine Corps. Our team has over 100 years of combined legal experience, and includes former insurance adjusters, a former insurance defense attorney, a retired FHP trooper, three licensed investigators, and over 40 professional and support staff to provide the personalized service that accident victims expect and deserve in their time of need. When you hire us, you're hiring a law firm that understands your health and your claim are important to you. We take both very seriously and we will make sure your rights are protected and that you are kept fully informed along the way. The firm prides itself on providing aggressive representation and the personal service you expect and deserve. And, unlike many law firms, we don't just settle! We don't simply take what the insurance company wants to pay, but rather we demand and fight for fair and just compensation for your injuries and all of your damages, including your economic and non-economic damages, such as pain and suffering and your loss of enjoyment of life. We handle all types of motor vehicle accidents, including auto crashes, tractor trailer, logging and semi-truck accidents, commercial motor vehicle accidents (CMV), motorcycle, recreational vehicle (RV), boating and also bicycle and pedestrian accidents. Whether it's a soft tissue or whiplash injury, an accident involving brain damage, spinal cord injury, other serious injury or even the wrongful death of a loved one, Ron and the accident and injury attorneys at the Law Offices of Ron Sholes, P. A., take each case seriously. Call us now for a free consultation or complete the case contact form and we will contact you at your convenience to discuss your rights. At the Law Offices of Ronald E. Sholes in Jacksonville, Florida, we bring a military-like commitment to our criminal defense and personal injury cases. Each of our attorneys had a long career of uniformed service in the U.S. military prior to law school. Our law firm investigator served more than 20 years in the Navy. The same positive spirit of teamwork, preparation, and commitment to mission that successfully saw us through such postings as Iraq, Kuwait, Korea and Bosnia, animates our approach to client service today. Florida Personal Injury Attorney Ron Sholes is a 10-year military veteran who was born and raised in Illinois and has made Florida his home for over 20 years. Ron received his undergraduate degree from Southern Illinois University while serving on active duty in the U. S. military. He received his law degree from the University of Florida. Ron is admitted to practice in all Florida State Courts. During his 10 years of service on active duty, Ron served in the Gulf War in Operation Desert Shield and Desert Storm, the Bosnian Conflict, and in several Counter-Narcotics Operations in the Southern Caribbean Sea and Eastern Pacific Ocean. Among other things, he was awarded the National Defense Service Medal, the Southwest Asia Service Medal, the Kuwaiti Liberation Medal, and two Navy/Marine Corps Achievement Medals. Ron is also an active member of the American Legion and Veterans of Foreign Wars, associations of service members who served during times of war. Now, Ron is dedicated to vigorously fighting for the rights of the firm's clients. Ron prides himself on providing the best possible legal representation and he has assembled a team of military veteran attorneys that will ensure this happens. This includes the personal service that you expect and deserve from a law firm. Ron understands this and that is why each of his clients has his personal cell phone number, as well as any other attorneys that are assigned to their case. Ron understands that your case is likely the most important thing going on in your life, and regardless of the scope of your particular case, you need your questions answered. 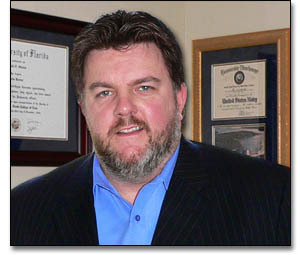 Ron is a member of the American Association for Justice and the Brain Injury Association of Florida. He often attends accident and injury training sessions throughout the country to stay abreast of the most current strategies in personal injury. When it comes to Personal Injury cases, Ron and the firm's attorneys understand that aggressive representation is a must! After an accident you should focus your energies on recovery, not dealing with insurance companies whose boards of directors are more interested in showing a huge profit for their investors. The big insurance companies have hired lobbyists to influence legislators to enact tort reforms and reduce awards to personal injury claimants. As an injured client you have rights for compensation for your losses and suffering. That's why you need a strong legal team like ours fighting for you. Our attorneys don't simply "practice" personal injury law. We are a firm of military veterans that understands what it means to serve. We don't simply wait around to see what happens with your case, we manage your claim and we maintain contact with you throughout the process so you are fully informed. When you hire our firm, you have an attorney handling your claim, not simply a paralegal. And, most of all, we fight for the compensation that you deserve. In addition to Personal Injury Law, Ron also represents clients in other areas of law such as Criminal Defense, DUI and Drug Defense, Medical Malpractice, and Family Law. Visit ronsholespa.com for information about those practice areas.